syncreon is the leading specialized contract logistics company consistently recognised for its operational excellence, customer integration and creation of great opportunities for employees and stakeholder value. Formed in Ireland in Janaury 2007 when Walsh Western International and TDS Logistics Inc joined forces to establish a new company. The two companies complimented each other right from the start as they specialise in end to end logistics and supply chain solutions to a customer base that spreads across the world. To make this all work, the company invest a huge amount of time on in-house training and ensuring the maximise the potential of their employees. They invest in their people, recruiting the best talent and developing their skills and careers. At all levels of the organisation, meaningful work and a sense of team fuels their dedication. The results speak for themselves in some of the longest tenure employees in the industry. syncreon's culture of continual improvement spans from personal development to performance management to career advancement. The wide-ranging results of this commitment are evident in their growth: of their employees, their relationships with our customers, and contributions to their community. With 13,000 employees worldwide and 200 of those based in Dublin, Cork and Limerick, syncreon is a global, asset-light provider of outsourced specialised logistics and supply chain. 'Speed to market' and efficient, secure transportation of goods are critical elements in maintaining a competitive edge, which is why they are carrier of choice for some of the world's leading manufacturers of computers, pharmaceuticals, medical devices, electronics and fast moving consumer goods. In addition to always using the fastest and most reliable/secure ferries and road routes, syncreon has developed a clear company approach to security, and has its own security department for a number of years that represents and manages security on a global level. The company enforces full compliance to security standards set by the likes of TAPA and C-TPAT programmes. syncreon Ireland were the first Irish haulier to receive ISO 13485 certification. All of these combine to make us a leader when it comes to guaranteeing our ability to deliver their clients' products in Europe. syncreon were the first Irish haulier to received TAPA TSR certification, while they are also are GDP certified. The company also have warehouse space available in Dublin, with the facility being a secure TAPA certified with 22,000 Sq ft available. 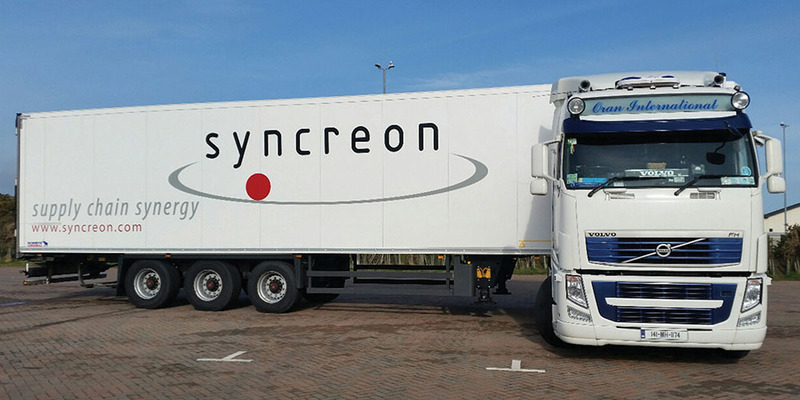 syncreon are not your traditional haulage firm as they are continuously looking to raise the bar as the aim to stay ahead of their competitors. With 88 facilities in 22 countries, the company operate on a global platform. Some of the attributes that set them above the rest are the likes of Premium Transit Times and this includes dual driving team trucks – this sees two drivers on a truck who alternate the driving allowing the maximum potential of the truck to be achieved. Driver/truck switch: This sees a driver placed at one of the high security sites who takes over from another driver and carries on to the destination. Having continuity in the supply chain is another area that syncreon place a great emphasis on and they have Business Continuity Recovery Plans (BCRP) in place to cope with any disruptions that may arise. The syncreon fleet is kept in pristine condition and they take their appearance very seriously as not only are the trucks and trailers in excellent working order, they are always kept clean both inside and out. The main focus has always been on the customer though and syncreon go that extra mile to ensure that their clients are more than happy with the service that is provided. To serve their customers, they have to maintain deep industry knowledge and expertise. syncreon continually build upon its decades of experience providing value-added third party logistics (3PL) services to global technology and automotive customers. In addition, its learning culture dictates that they continue to anticipate future industry developments and create strategic next-generation solutions. The company has earned an industry reputation for listening, innovating, and delivering excellent results. To ensure their continued customer focus and success, they follow a number of crucial points such as: structure their teams around customer service and responsiveness; apply deep industry expertise to address their customers’ current and future supply chain needs; act as advisers for their customers on supply chain cost and performance; seek customer feedback to continually improve their performance. syncreon Way is who they are and how they operate. syncreon Way is how they succeed every day in their customers’ supply chains. Key features of its corporate DNA are consistency and continuous improvement. They operate business to provide consistency across all of the operations. In addition, the company continuously innovate and improve performance for its customers. The learning culture ensures best practices and the latest thinking are continually incorporated into their world-class processes. syncreon Way is the set of processes and tools they use to achieve this robust combination that makes us uniquely syncreon.